There are many products around these days to help you with grooming and personal appearance. One of the items that you can purchase is a nose hair trimmer, which provides the ideal solution to keeping unsightly nose hair at bay. In fact, when you find the best nose hair trimmer you can often use it for other purposes because it comes with additional attachments. This includes using it as an eyebrow trimmer and even as an ear hair trimmer. These trimmers provide a fantastic and cost-effective means of controlling unwanted hair for men. Many men have problems when it comes to ear hair, nose hair, and overgrown eyebrows. With these products, you can ensure that these issues become a thing of the past. The trimmers are extremely easy to use and you can get both manual and battery operated ones. The battery ones are the most convenient because you only need to use one hand to operate the trimmer and you can get the job done quickly, conveniently, and painlessly. Manual trimmers don’t make a noise like the battery operated ones but it does take longer to trim your nose hair when using one of these. You will also find a number of trimmers that are corded or can be recharged, although the battery operated and manual ones are the most common. When choosing between the battery and manual trimmers, you need to take into consideration the pros and cons of each. With a battery operated trimmer, you have the benefits of ease, convenience, and speed but you also have the noise to put up with. In addition, you need to replace the batteries and if they start to die, you may find that these trimmers begin tugging at the hairs rather than trimming them. Manual trimmer enables you to benefit from greater control and there is no need to replace batteries or put up with noise. However, they are more difficult to use and take more time. 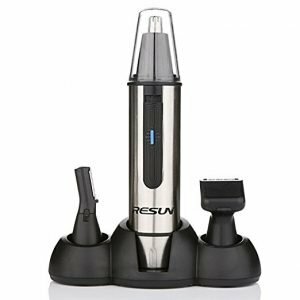 By purchasing the best nose hair trimmer, you can benefit from total versatility with a gadget that is able to trim hair in other areas as well as the nose. Some of the best ones are very effective on facial hair as well as on ear hair and eyebrows. Some can even be used to keep your beard under control, so make sure you look at the capabilities of the nose trimmer before you make your purchase. You can then make an informed decision with regards to the trimmer that you purchase based on the areas of the face you want to use it on. The cost of the trimmer: The cost of nose hair trimmers can vary widely based on the manufacturer, where you purchase it from, and its capabilities. Obviously, the top of the range trimmers that offer versatility and are multifunctional tend to be more costly than the lower end ones. It is worth checking your budget to see how much you can realistically afford to spend on the trimmer before you start looking. This will enable you to find a suitable trimmer that is within your price range. The capabilities of the trimmer: As mentioned above, some of the more basic trimmers are for use on nose hair only but others are able to tackle ear hair, eyebrows, and facial hair. Before you make your purchase, make sure you look at the capabilities of the trimmer so that you find one that is perfectly suited to your needs. If you only need to for nose hair then a more basic model will be fine but if you want to use it on other areas such as facial and ear hair, you need to look for a multifunctional model. Reviews of the trimmers: If you want to purchase with confidence and find out how effective the trimmers you are considering are likely to be, it is well worth checking out reviews from consumers that have already purchased and tried the trimmers. This will provide you with valuable peace of mind and will make it easier to determine which trimmers are going to be right for you. Battery, electric or manual: You will also need to check whether the trimmers you are considering are battery operated or manual ones. This will enable you to choose the ones that best fit in with your needs. if you want speed and convenience, the battery ones are a great choice. If you want more control, then you may find that the manual ones are more suited to your needs. You can also go for the higher end electrical and rechargeable ones. The blade metal: One more thing to check when you are looking for nose trimmers is the material that the blades are made from. This could include stainless steel, titanium, hypoallergenic blades, or aluminum. You should find ones that have the right blades for your specific needs. For instance, if you have sensitive skin you can opt for hypoallergenic blades. If you want a trimmer with blades that won’t rust over time, you may prefer the stainless steel or titanium ones. By taking all of these factors into consideration, you should find it quick and easy to find the best nose trimmer for your needs. You can then enjoy a simple and convenient means of improving your appearance with minimal hassle, discomfort, and time. You will also find it much easier to find trimmers that are within your price range by first working out your budget. This will enable you to spend time looking at trimmers that are definitely going to be within your price range rather than spending time looking at ones that are too expensive. However, also bear in mind that finding quality trimmers at discounted prices is fast and simply online, so you could enjoy getting excellent quality for far less than you imagined. When it comes to finding the best nose hair trimmer options, you will find plenty of choices available with trimmers available from a wide range of well-known manufacturers. Many of these trimmers offer a high level of functionality and this makes them excellent all in one grooming tools that can be taken on your travels for use at home. Of course, there are also more basic models available but for those that want precision grooming with a multifunctional tool, the more advanced ones are often the best option. If you are looking for the convenience of the rechargeable trimmer, this product could be the ideal choice. This is a top rated nose hair trimmer and offers a range of benefit in addition to superb quality. It comes in a stylish design and is easy to handle. In addition, you don’t have to worry about batteries because you can recharge these trimmers for a lifetime. The stainless steel blades are designed not to rust over time, and you even get to benefit from a lifetime warranty with this product. One of the things you will love about this trimmer is its versatility. Not only will you benefit from one of the best nose and ear hair trimmer options, but you can also use it as a men’s eyebrow trimmer and on facial hair such as sideburns. The trimmer comes with all of the attachments that you need to make the most of its multifunctional design. In addition, it has a brushed steel finish, which means that you get to benefit from increased durability. This is a trimmer that is robust and designed to last, so you should be able to enjoy many years of comfortable grooming. When it comes to using this product, you should have no problems at all. It is very easy to use and will trim the hair on your face, eyebrows, nose, and ears without tugging and be causing discomfort. It is also very easy to clean this trimmer, so you don’t have to worry about ending up with a high maintenance product. You can look forward to total comfort and convenience when you use the trimmer and you will also benefit from extremely affordable pricing. If you are looking for precision grooming, this could be the ideal option for you. When you use this trimmer, you will benefit from great results so you can look perfectly groomed at all times without going to any hassle or inconvenience. You don’t have to worry about the discomfort that you can get with low-quality trimmers, as this product is designed to do a great job comfortably and quickly. It also comes with thousands of excellent consumer reviews, which is another indicator of its high quality and effectiveness. With its stylish design, lightweight and compact size, and portability, this nose trimmer is the ideal choice for men looking for the best nose and ear trimmer. It is a hardwearing product made to very high standards and is designed to provide you with excellent results and enhanced comfort levels. 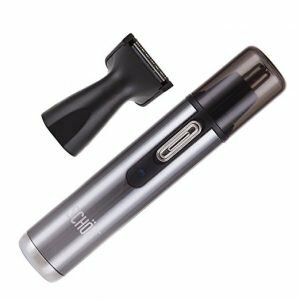 If you are looking for the best facial hair trimmer, you need to look no further than this gadget, as it will also tackle stray facial hairs to ensure you look perfectly groomed with minimal fuss. Cleaning and maintain this trimmer is very simple. Also, because it is battery operated, you don’t need to worry about cords or recharging it. All you need is one AA battery and you can maintain your grooming routine no matter where you are. 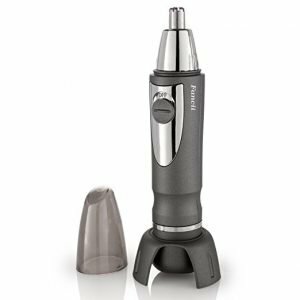 With this trimmer, you can benefit from an effective tool for dealing with nose hair, ear hair, stray beard hair, sideburns, and eyebrows. This makes it an extremely versatile tool that is ideal for men that want to look their best. It is also perfect for men that tend to travel around a lot and spend a lot of time away from home. This is because it offers complete portability so you can continue with your grooming routine with ease. The integrated LED lighting means that you can easily see what you are doing, which means that you can benefit from a powerful tool that offers the perfect control and precision for the best results. This is a heavy duty steel trimmer, which means that it is designed to last without fear of rusting over time. It is also water resistant, so you can even use it while showering and you can get it clean with ease. This product is also very comfortable to handle and use, so you won’t have to put up with tugging and discomfort when you are removing hairs on it. While it is not as cheap as some other options, the trimmer still offers excellent value for money given the high quality. Reviews from thousands of other customers are extremely favorable, which is a testament to the quality of this trimmer. 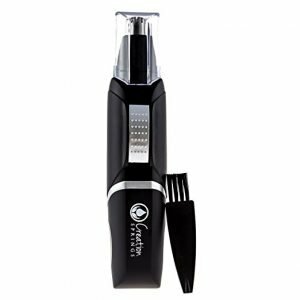 If you want the best nose hair clippers, the best ear hair trimmer, the best facial hair trimmer, and the best eyebrow trimmer all rolled into one, this could be the perfect choice for you. Finding the best face trimmer that can be used on nose hair, ear hair, and facial hair can be a challenge sometimes, but when you opt for this particular product you may have found just what you are looking for. Made by Fancii, this trimmer has a huge amount to offer including total versatility, portability, and affordability. It comes in a beautiful modern design and has an LED light, stainless steel blades that are also hypoallergenic, water-resistant blade head, and a rubberized body for really easy and comfortable handling. This adds to its ease of use and ergonomic benefits. This trimmer works on just one AA battery, and this means that it is also cost-effective to use. In addition, you won’t have to worry about cords or recharging, which is especially convenient if you want to take it with you on a trip or if you are traveling for a day or two. This is a trimmer that is powerful and offers the ultimate in precision when it comes to removing stray hairs. 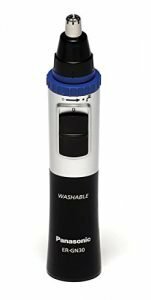 This makes it perfect if you are looking for an excellent nose hair trimmer combined with the best ear hair trimmer and the best eyebrow trimmer. Using this product to remove hair means that you can groom yourself quickly, conveniently and painlessly. 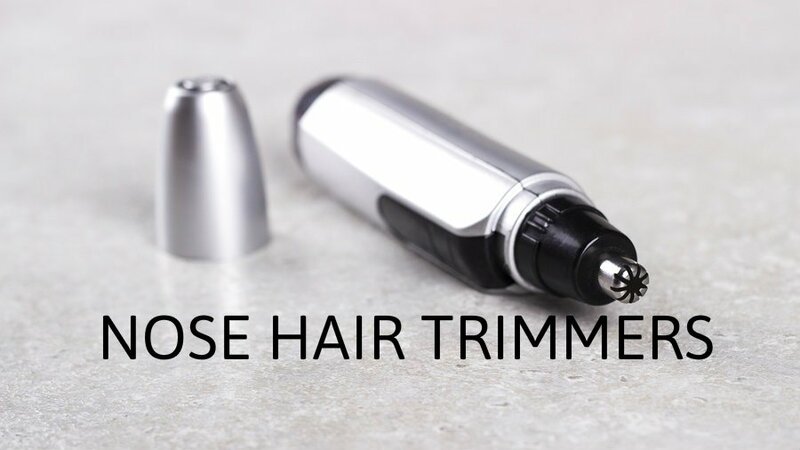 You will be able to benefit from excellent results with this trimmer and you can benefit from a gadget that removes hairs efficiently without tugging or pulling. Even if you have sensitive skin, this trimmer will be ideal because the blades are hypoallergenic. With its non-slip design, you can ensure you have maximum control when using the trimmer while the LED lighting will ensure that you can pick up on any stray hairs with ease. This trimmer comes in a chrome finish and a stand so you can store it away safely without any problem. While there is a guarantee, this lasts for 18 months which is one of the downsides given that many others come with a lifetime guarantee. However, the excellent quality of the product means that you should not experience any issues. Also, you do get a 100 percent satisfaction guarantee, so if you are not happy with the product you can get a full refund. Ideal for businessmen and other men that want convenience and quality, this nose and ear hair trimmer is a perfect solution when it comes to looking great. 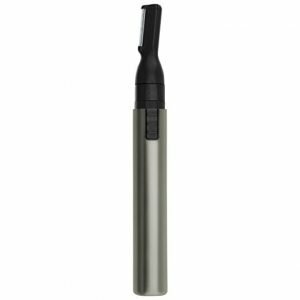 If you want the best nose hair trimmer for convenience while on the go, this could be the right product for you. You can also benefit from having the best ear hair trimmer with just one tool, which is perfect for businessmen that are always on the go traveling from one meeting and place to another. It means that you can benefit from looking well groomed no matter how long you have been on the road. This product comes with a stainless steel rotary blade, so you get perfect results and a product that is designed to last without rusting up. In addition, it comes with the added benefit of being very quiet when being used, so there are no disruptions or disturbances for other people while you are using the trimmer. The LED light that is built into the trimmer makes it far easier for you to see what you are doing so you can enjoy precision grooming no matter where you are. In addition to removing nose and ear hair, you can also benefit from having the best facial hair trimmer and the best eyebrow trimmer all combined into one handy tool when you opt for this stylish product. The design of the trimmer is stylish and modern with a combination of black and dark grey along with a compact size. It can be used both wet and dry, so if you want to you can even take it into the shower with you and multitask by showering and grooming at the same time. This is a powerful and efficient product that is easy to operate and requires no cords or sockets because it runs on batteries. There is a high safety switch incorporated into the design, which means that you won’t accidentally turn it on and cause yourself an injury. With hundreds of excellent reviews from other customers, you can benefit from confidence and peace of mind when you invest in this trimmer. You can check these reviews to find out how others found the trimmer and this will give you an idea of what to expect if you decide to order it. Versatile, stylish, and powerful, this hair trimmer from Creation Springs is a great tool for any man that wants to ensure he looks his best at all times. This is a tool that can be carried around with ease so you can take it on business trips, pack if for your vacation, take it on overnight stays, or simply use it at home. You will find that the stainless steel rotary blades offer powerful performance while the LED light ensures you can benefit from total precision and control when you are using the trimmer. It offers wet and dry functionality, which means that you can even use it in the shower and will find it easy to maintain and clean. You won’t need to worry about electrical outlets or inconvenient cords with this trimmer, as it runs on just one AA battery. This means that you can benefit from the fuss-free operation and total portability with this product. In addition, it has a unique triple vented vacuum that will help to ensure that you get great results with minimal fuss so you can always look your best. The trimmer comes with a range of attachments, which makes it ideal for trimming nose and ear hair as well as facial hair and eyebrows. While it does come at a higher than average price, you will enjoy the total functionality and excellent quality when you choose this trimmer. With the built-in LED light, you won’t have to worry about missing stray hairs because you can pick up on these with far greater ease. This means precision grooming and great results every time. With hundreds of great reviews from those that have already tried the product, you won’t need to worry about ending up with a substandard product. It is ergonomically designed, so you can even look forward to using a trimmer that is exceptionally comfortable to handle. It has a rubberized casing that is made from recycled plastic, so you can get a great grip on it and enjoy knowing that you are using an environmentally friendly product. This has proven to be a very popular product amongst men that want a great grooming experience and powerful performance with minimal hassle. 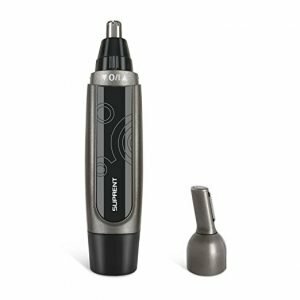 This trimmer is one that offers a high degree of versatility and functionality, which makes it a great choice for those that want an all in one device to help them look great. While it is a little heavier than many other trimmers, it does offer robust design and total durability, which means that you can continue to enjoy its benefits for years to come. If you want a product that you can carry around when you go on trips and on vacation, you will find that this is a perfect choice. This trimmer is packed with features and ensures you get fantastic results each and every time. The ergonomic design of this trimmer means that you can enjoy total comfort when you are using it. In addition, the stainless steel blades will not rust up and are hypoallergenic making it ideal for even those with sensitive skin. You can ensure you capture every stray hair when using this product thanks to the LED light and there is even an anti-slip safety switch for peace of mind. The wet and dry function means that it is not only easier to clean but can also be used in the shower without any problems. Wherever you are, you can enjoy the portability of this handy trimmer and keep yourself well groomed at all times. Carrying the device around is easy because it all comes in a handy pouch for ease and convenience. In addition, you get a free storage stand, cleaning brush, and a range of attachments so that you can groom your face, eyebrows, nose hair, and ear hair with ease. The motor of this trimmer is very powerful but does not make a lot of noise like many others can. This means that you can also enjoy grooming yourself without causing a disturbance to other people. You only need one AA battery to operate this trimmer, which does away with the need for fussy wires and cords as well as the need to have access to an electrical outlet. Instead, you can just use is wherever and whenever you want to. So, you never need to sacrifice your grooming routine when you are on your travels simply because you are unable to charge it up, which is great news for those that spend a lot of time traveling by car or air. Over the years, Panasonic has become a huge name in the world of technology and this includes the creation of personal grooming products such as this nose and ear hair trimmer. This is a device that is packed with great features and is the perfect tool for men that want to be able to stay well groomed no matter where they are. With its battery-powered design, you can take this trimmer with you anywhere and you don’t have to worry about recharging or finding an electrical socket to use when you are away from home. This makes it very portable as well as extremely versatile with a range of functions. This Panasonic nose trimmer not only keeps your nose free from unsightly hairs but can also be used on ear hair, eyebrows, and facial hair. This means that you can enjoy the convenience of having one handy tool that will groom all areas to keep you looking and feeling great. You also have the peace of mind that the product is from a reputable and well-known manufacturer, which means you can look forward to great quality. Considering the make and quality of the trimmer, the price is very reasonable too. You will find plenty of great features with this trimmer. It is a wet and dry trimmer, so you can use it in or out of the shower. In addition, it has a unique Vortex Immersible cleaning system, which makes it a breeze to wash and maintain. The dual edge rotating blade is designed to provide perfect precision when trimming. In addition, the blade is also hypoallergenic, so you will find this the ideal grooming companion if you have skin that is sensitive. The design of the trimmer is compact and lightweight, which makes it all the more convenient to carry with you when traveling. You will be able to benefit from the powerful performance as well as comfortable handling of this beautifully designed trimmer. In addition, you have the peace of mind of knowing that it has received literally thousands of great reviews from other customers. If you want a trimmer that combines total versatility with convenience and high spec features, this is a great choice. If you are looking for something more basic in terms of a nose and ear hair trimmer, this Conair model could be a good choice. While it does not have the same amount of features as many of the more advanced models, it is fine for a backup or as a main trimmer if you just want something that is quick, simple to operate, and convenient. This is a battery operated trimmer and comes at a very reasonable price. It has a blade that can be rinsed for ease of cleaning and it has a compact and lightweight design so that it can be carried out with ease. This trimmer comprises a cutting system that is powerful and effective. The overall design is not quite as modern and stylish as some others but it gets the job done. It also comes at a very low price, which makes it ideal for those that are on a budget. It manages to cut nose and ear hair quickly and conveniently with no pulling, although some consumers have stated that cutting ear hair is a little more difficult with this model compared to some of the higher end alternatives. There is also a limited two-year warranty for additional peace of mind. The trimmer has a flat blade edge for effective and convenient trimming. It is also easy to wash so keeping it clean should not be a problem. 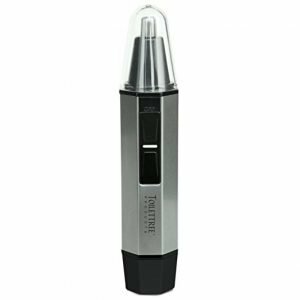 Because the trimmer is battery operated, you won’t need to concern yourself about pesky cords or access to electrical outlets because you can simply change the batter when required and you’re good to go. This is not the most effective trimmer on the market and some find that it does not cut hairs close enough. However, for many people, this model has proven to be an effective and very affordable solution to having a personal grooming tool that can be taken anywhere and used at anytime. Panasonic is a name that has become synonymous with quality, having designed and created grooming products for both men and women over the years. Many people associate hair trimmers with men for their personal grooming. However, this particular model is designed for women and this is reflected in both the design and the functionality of the product. Like men, many women have trouble with facial hair including nose hair and upper lip hair. Well, this product is designed to help combat these problems and it can even be used as a bikini line razor, which makes it all the more versatile. With its attractive coloring and design, this trimmer is very discreet and can be taken anywhere because it operates on a battery so you don’t need to trouble yourself with fiddly cords or finding an electrical socket to use. It is compact, slim and lightweight, so can trim your hair quickly, easily, and in total privacy whenever and wherever you need to. It comes with a detachable blade that can be rinsed with ease and it is perfect for women that travel or are going on vacation and want a simple yet effective grooming tool to use. The trimmer has protective shields that stop the sharp razor from cutting the skin, so you also get an increased element of safety. It will not pull or tug at hair – it neatly and conveniently trims it away with the sharp blade so you can enjoy greater confidence by addressing nose and facial hair problems as well as getting that bikini line trimmed ready for your beach vacation. You can also use this trimmer on your eyebrows to get rid of stray hairs, so it really is a very versatile product. This is quite a costly device compared to the trimmers that you get for men. However, it does offer a lot of functionality and the design is robust yet attractive and discreet. This makes it a popular choice amongst women, particularly for those looking for performance, quality, portability, and a product from a well known and reputable manufacturer. It even fits nicely into your makeup bag, which means that you can carry it around without any issues. For men that want simplicity, convenience, total portability, and affordability from their trimmer, this handy little tool could be the perfect solution. With its clean, modern design and simplicity, you can take this trimmer with you wherever you go and enjoy being well groomed at all times. The trimmer has a strong and durable anodized aluminum body along with quality stainless steel blades that are designed to provide precision trimming and will not rust. It is also lightweight, which makes it easy to handle and to carry when you are on your travels. This tool is ideal for shaving and hair removal and it comes with a number of attachments. You can trim your beard and facial hair, nasal hair, and you can even use the special attachment to get your eyebrows into shape. The blade is a wet and dry one, which means that you have greater flexibility over where you use the product and you can get it clean with ease and speed. With this trimmer, you can look forward to precision trimming that is powerful yet safe and simple, which is what all busy men want from their grooming products these days. Better still the price of these trimmers is surprisingly low. When you purchase these trimmers, you will receive a generous three-year warranty for enhanced peace of mind. In addition to this, the manufacturer also offers a 60-day satisfaction guarantee, so if you are not totally satisfied you can get your money back. The lithium battery actually comes included with the trimmer, which represents even greater value for money, as these batteries can last for years. You also don’t have to fuss around with cords and electrical outlets because this is cordless, battery operated trimmer that can be used anywhere and at any time. It is a little louder than some other models but this trimmer does offer great performance, particularly for the price. While it is advertised for men, it has also been used by some women to effectively get rid of hair on the upper lip, which makes it all the more versatile. You also won’t have to worry about the trimmer pulling and snagging hairs, as it is very effective at using the powerful blade to trim perfectly and provide you with the ultimate in control and precision. If you are serious about your grooming, you know just how important it is to get the right product for your needs. With this wide range of high-quality trimmers, you can find the perfect one without any trouble. In fact, the choice of trimmers that are available today means that you could find yourself struggling to decide which of them to choose. By making sure you look at reviews of the trimmers, check their functionality and versatility, and take careful note of the specifications, you will find it far easier to make your choice. In addition, you can also factor your budget into the equation so that you end up with trimmers that are within your price range and suited to your needs.